September 2018 - What would we do without wood? The Provincial Grand Master, R.W.Bro John Morgan was in attendance for the Lodge meeting on 3rd September, together with his Deputy, V.W.Bro Philip Voisey and fifty five Mark Master Masons from all round the Province. In addition to the usual business of the Lodge W.Bro David Lyons, the Provincial Almoner gave an interesting talk entitled "What would we do without wood?" David is a former woodwork teacher who although retired from that noble profession still hones his skills by repairing and restoring old furniture and indeed making new pieces. We are, he said surrounded by wood in this Lodge room. He then went on to explain the different woods used in the Lodge room, there origin and why they were specifically suited for purpose. It was a wide ranging and interesting talk on what is a massive subject. His talk was enjoyed by all who had the privilege to be present. In the photo, left to right, Barrie Baker - Senior Warden, Master - Michael Jakins, Senior Warden - Richard Stone and David Lyons. 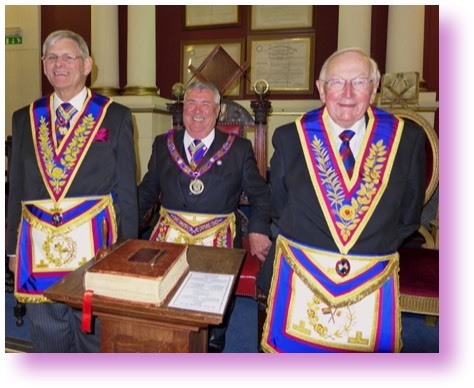 1st June 2015 - Provincial Grand Master is Installed in the Chair of the Lodge. After an excellent meeting the brethren retired to the dining room where the usual Mark Fellowship was enjoyed. Photo left to right. Ian Cox - Junior Warden, John Morgan - Master and Philip Cole - Senior Warden. Installation 2013. W.Bro Mike Waterman becomes the 25th Master of the Lodge and gave a very interesting inaugural address titled “why I enjoy Mark Masonry” which included a brief history of Mikes progress in Freemasonry from his Initiation into a Bristol Lodgeup to the present time. Seventy of members and several guests saw W.Bro David Veal make a great job of installing his successor at Taunton Masonic Hall. In the picture are John Morgan - Deputy PGM, Derek Wilton - Junior Warden, Mike Waterman, David Nelson - PGM, Senior Warden - Richard Francis and Tony Atherton the Provincial Senior Grand Warden. Installation 2011. W.Bro Keith Fisher is installed as Master and gave a very interesting inaugural address on the history of the degree. Forty Members and several guests attend the meeting at Taunton. The picture shows Tony Hick Past PGM, David Veale Senior Warden, Keith Fisher Master seated, Mike Waterman Junior Warden and Ray Guthrie Deputy PGM. 24th May 2010 - Somerset Installed Mark Masters Lodge Installation at Taunton Masonic Hall. The Master Matt Westley made an excellent job installing his successor Richard Leonard in the Chair of the Lodge. It was an interesting evening not only the installation but the Travelling Keystone was presented to the new Master by the Immediate Past Master of Portcullis Lodge David Bates, who was well supported by brethren of Portcullis. The new Master also presented a very generous cheque for £250 on behalf of the Lodge to the Deputy PGM, Ray Guthrie, for the Provincial Grand Masters appeal. Photos and report. 5th Sept 2010 - Summer outing to the Bishop's Palace. It was soggy and rather dull Sunday morning but that it didn't dampen the spirits of the group who had gathered at the entrance to the Bishop's Palace in Wells for a tour of the gardens and the palace itself. Fortunately the rain held off while we toured the gardens and as you can see from the photograph it started at the end of the tour when we reached the wells. Then it was inside for a conducted tour of the Palace followed by a delightful lunch in the refectory. Over 15 members and their wives, more than 30 in total enjoyed the day which was organised by the master Richard Leonard and his wife Patricia. The tour guide was very knowledgeable about both the gardens and the Palace and the history of the Cathedral, it is a local place of great interest, sometimes overlooked by visitors to the Cathedral next door, but it is well worth a visit. May 2010 - Installation report.